ROSSETTI, Dante Gabriel (1828-1882). Poems. London: F.S.Ellis, 1870. 8° (219 x 136mm). Contemporary green morocco by F. Bedford, gilt floral mosaic corner-pieces and spine compartments. Provenance: publisher's presentation copy to John Ruskin, Brantwood (ex-libris) -- purchased from Howard Mott, New York, 17 February 1942, $35 (with autograph letter signed ('F.S. Ellis') to 'Dear Sir' [presumably to John Ruskin], Covent Garden London, 7 September 1871, 2 pages, 8°, inserted). FIRST EDITION, ONE OF 25 COPIES ON LARGE PAPER, JOHN RUSKIN'S COPY. 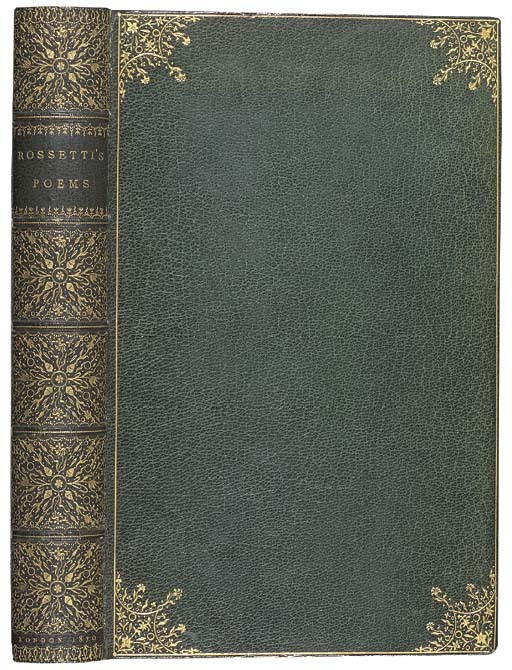 The Poems appeared in April 1870 amidst general acclamation, firmly establishing Rossetti's reputation both as poet and painter. In a letter to Mrs. Gabriele Rossetti, the poet wrote 'My book will have brought me £300 in less than a month, which is not so bad for poetry, particularly if it goes on.' By the beginning of June, his Poems had entered its third edition of 500 copies each; in September its fourth, to be followed by a fifth and sixth before the end of the year. The collection largely consists of rearrangements of earlier works. 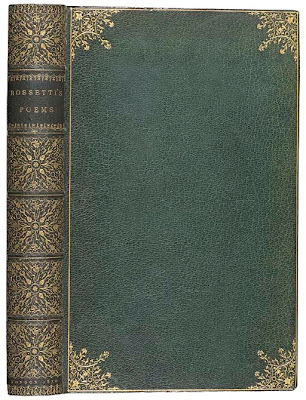 It is interesting to note that despite their estrangement by 1870, Rossetti still sent Ruskin a presentation copy of his poetry, along with Patmore, Meredith, Tennyson and Browning. From his position as the foremost English art critic, Ruskin had defended the work of the Pre-Raphaelite Brotherhood in 1851, although he did not make Rossetti's acquaintance until the end of 1852 when Ruskin wrote favourably of Rossetti's works at the Winter Exhibition of watercolours in Pall Mall. Their correspondence began in 1854, when they also started teaching drawing together at the Working Men's College, and Ruskin adopted the painter as his new protégé after Millais's departure. However, Ruskin's admiration for Rossetti's talent, which he keenly patronized together with Elizabeth Siddal, was marred by an increasing dislike for his untidyness, unreliability, intermittent inertia, and general Bohemian way of life. Far more eager to obtain advance payments than to finish pictures, Rossetti's continual requests for financial aid eventually alienated the critic, whose benevolent enthusiasm slowly declined. A letter from the publisher and well-known London bookseller, F.S. Ellis, describes the book as being the product of which 'machinery has had no part or lot,' thus it has been printed at a hand-press on handmade paper and bound by hand in hand-draped leather. Hayward 283.